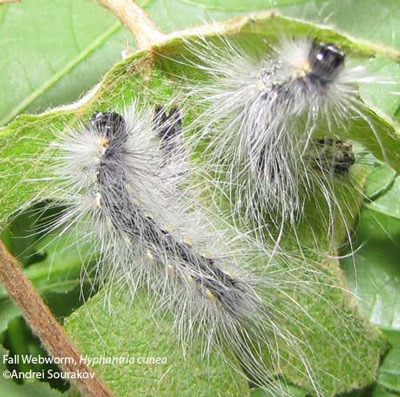 The fall webworm, Hyphantria cunea (Drury), is a pest of a number of ornamental trees and shrubs as well as of several agricultural crops. The larvae feed in huge nests and are able to completely defoliate trees and shrubs. Native to North America, this species has become an invasive pest throughout Europe and Asia, and therefore is well studied. Figure 1. Adult male fall webworm, Hyphantria cunea (Drury). This adult is all white, which is typical for members of this species from the northern part of its range. 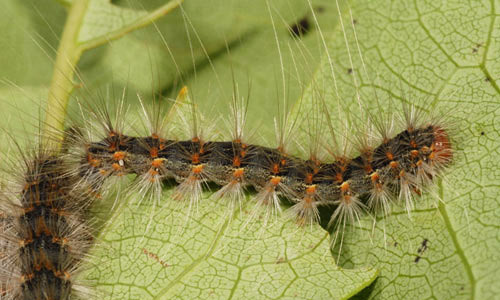 Photograph taken in Gainesville, Florida, from a reared larva. Photograph by Andrei Sourakov, Florida Museum of Natural History, University of Florida. 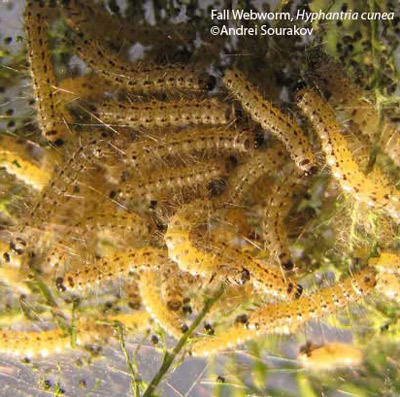 The fall webworm originally occurred throughout North America to its northernmost limit in southern Canada. The nothern range limit for Hyphantria cunea occurs at the latitude of 50–55° (Morris 1963). 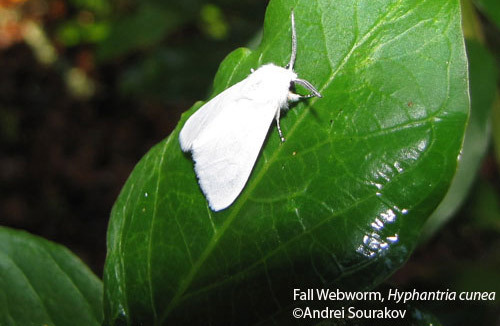 The fall webworm was introduced into Yugoslavia in the 1940s, and since then has invaded most of Europe. It now also inhabits parts of China and North Korea, again due to accidental introduction, and it is found in Japan. Figure 2. 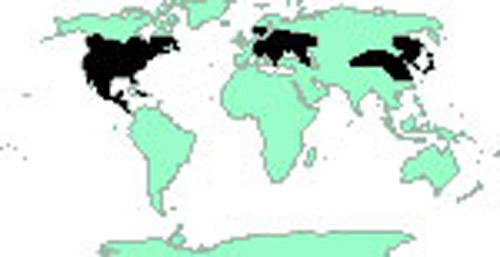 Worldwide distribution as of 2010. 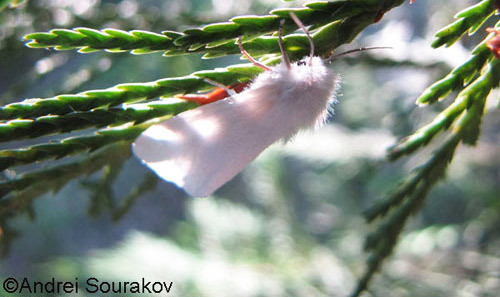 The adult fall webworm moth is bright white, with a hairy body. In the southern part of its range, the moth is white with dark wing spots while in the northern part of its range it is nearly always pure white (MPG 2010) and was once thought to be a separate species from the southern populations. The gregarious larvae form large tents around the host plant. Currently, the taxonomic status of Hyphantria cunea as a single species remains intact. The variations in phenotypes of both adults and larvae (presence of dark markings on the wings in some populations and presence of populations with red-headed vs. dark-headed larvae) has caused speculation that more than one species might be involved. For example, in Japan, DNA barcoding studies have shown that two species might be occurring there sympatrically (Takeda 2005). Figure 3. Adult male fall webworm, Hyphantria cunea (Drury). This adult is all white, which is typical for members of this species from the northern part of its range. Photograph taken in Gainesville, Florida from a reared larva. Photograph by Andrei Sourakov, Florida Museum of Natural History, University of Florida. 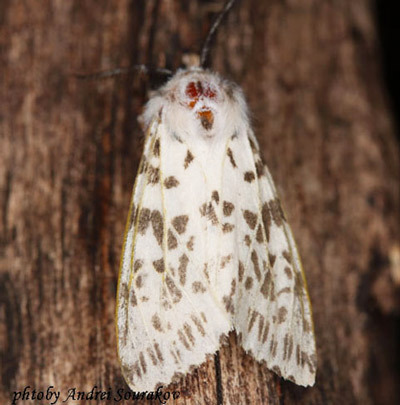 Figure 4.Adult fall webworm, Hyphantria cunea (Drury), with spots on white, which is typical for members of this species from the southern part of its range. Photograph by Andrei Sourakov, Florida Museum of Natural History, University of Florida. Figure 5. Adult fall webworm, Hyphantria cunea (Drury), with spots on white, which is typical for members of this species from the southern part of its range. Photograph by Andrei Sourakov, Florida Museum of Natural History, University of Florida. 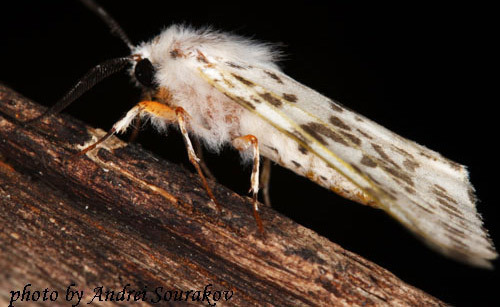 Like most moths, the fall webworm moths are nocturnal and are attracted to light. 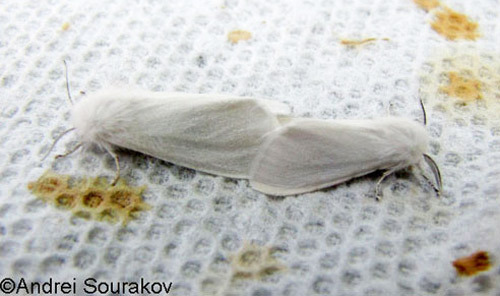 Adult moths have a wingspan of between 1.4–1.7 inches (35–42 mm). The bases of the front legs are orange or bright yellow. The number of generations per year depends greatly on latitude. 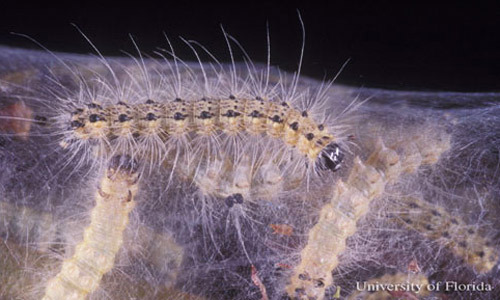 Southern populations may complete four generations in one year, while in the north the fall webworm completes only one life cycle. The univoltine chiefly black-headed and dark-bodied larvae tend to occurs above 40° latitude, while the multivoltine cycles with green-bodied, red or black-headed larvae tend to be found in the southern part of the distribution area. Adults emerge as early as March in the south, but do not fly until late spring or early summer in northern areas. Mostly, the adults appear from May to August and deposit their eggs. Figure 6. A mating pair of fall webworms, Hyphantria cunea (Drury). These individuals were reared from the same nest of black-headed larvae, collected on bald cypress in Gainesville, Florida. Photograph by Andrei Sourakov, Florida Museum of Natural History, University of Florida. Eggs: The egg mass of Hyphantria cunea is almost iridescent green in color. The egg batch contains 400-1000 eggs. 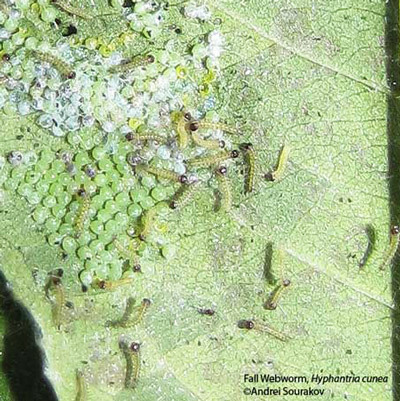 The eggs are usually deposited on the undersides of leaves in the spring, in a single (black-headed larva race) or double (red-headed larvae race) layer of several hundred eggs. 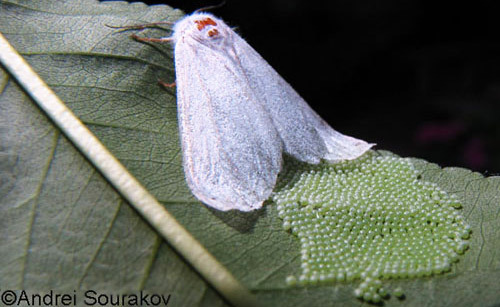 The egg mass is lightly covered with scales from the female's abdomen. Figure 7. Adult female fall webworm, Hyphantria cunea (Drury), laying eggs. Usually there are 400-1000 eggs in a batch. Female dies following oviposition, never moving from the leaf. Photograph taken in Gainesville, Florida. Photograph by Andrei Sourakov, Florida Museum of Natural History, University of Florida. Figure 8. 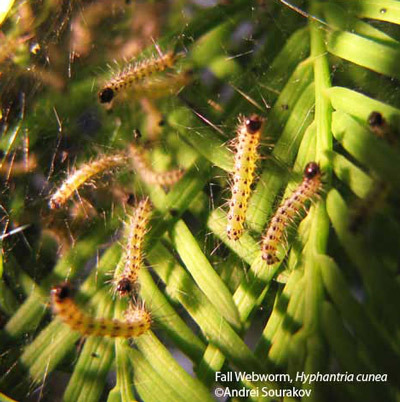 Eggs and neonate larvae of the fall webworm, Hyphantria cunea (Drury). Photograph taken in Gainesville, Florida. Photograph by Andrei Sourakov, Florida Museum of Natural History, University of Florida. 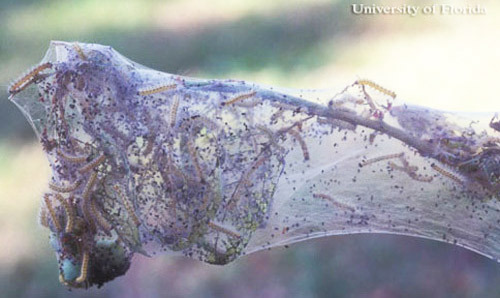 Larvae: In one to two weeks, the larvae hatch and immediately begin spinning their silk tent. 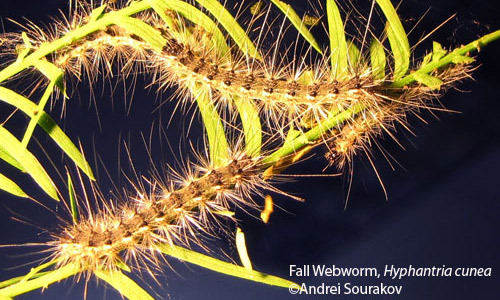 The neonate caterpillars place the web over single leaves and feed by skeletonizing. Figure 9. Fall webworm, Hyphantria cunea (Drury), larvae. Photograph taken in Gainesville, Florida. Photograph by Andrei Sourakov, Florida Museum of Natural History, University of Florida. Figure 10. Close-up of second instar larva of the fall webworm, Hyphantria cunea (Drury). Photograph taken in Gainesville, Florida. Photograph by Andrei Sourakov, Florida Museum of Natural History, University of Florida. Figure 11. Second instar larvae of the fall webworm, Hyphantria cunea (Drury), feeding. Photograph taken in Gainesville, Florida. Photograph by Andrei Sourakov, Florida Museum of Natural History, University of Florida. Figure 12. 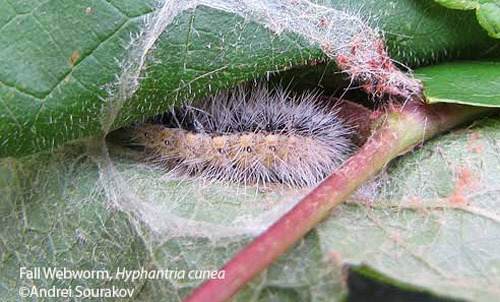 Second instar larvae of the fall webworm, Hyphantria cunea (Drury), before molting. Photograph taken in Gainesville, Florida. Photograph by Andrei Sourakov, Florida Museum of Natural History, University of Florida. 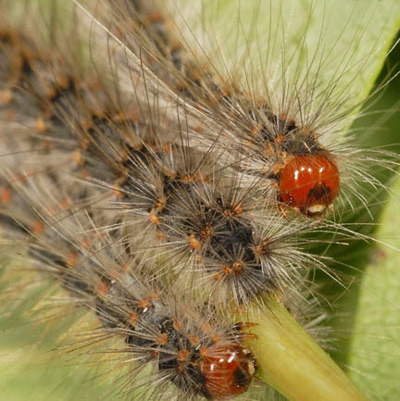 Mature larvae are hairy and either have a lime green body with black spots or can have darker color, especially in the later instars. The head capsules in some populations can be either red or black. In other populations, they are entirely black. The black-headed larvae are thought to be more prevalent in the northern climes, while the red-headed larvae are thought to be dominant in the southern climes. Some behavioral differences have been noted between different larval morphs. 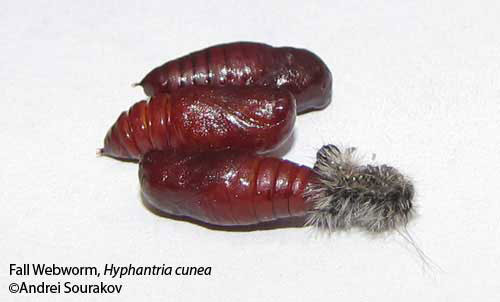 For instance, larvae of the red-headed morph stay inside the tent throughout the larval stage, while the black-headed morph leaves the tent in its fifth instar. Figure 13. Late instar, red-headed morph larvae of the fall webworm, Hyphantria cunea (Drury). Photograph by Lyle J. Buss, University of Florida. Figure 14. Late instar, black-headed morph larvae of the fall webworm, Hyphantria cunea (Drury). Photograph by Lyle J. Buss, University of Florida. Figure 15. Third instar larvae of the fall webworm, Hyphantria cunea (Drury). Photograph taken in Gainesville, Florida. Photograph by Andrei Sourakov, Florida Museum of Natural History, University of Florida. Figure 16. 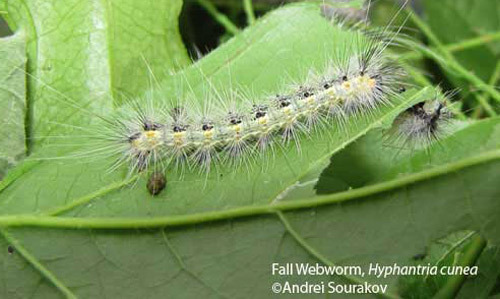 Third instar larvae of the fall webworm, Hyphantria cunea (Drury), feeding. Photograph taken in Gainesville, Florida. Photograph by Andrei Sourakov, Florida Museum of Natural History, University of Florida. Figure 17. 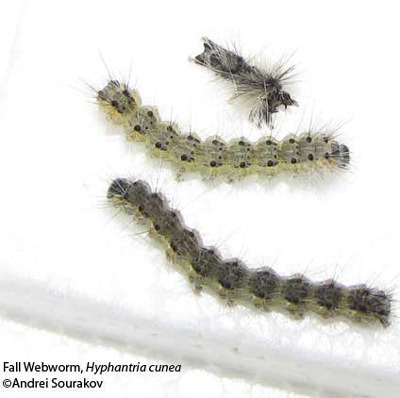 Fourth (middle) and fifth (bottom) instar larvae of the fall webworm, Hyphantria cunea (Drury). The top image is the skin left behind by a molted fourth instar caterpillar. Photograph taken at Gainesville, Florida. Photograph by Andrei Sourakov, Florida Museum of Natural History, University of Florida. Figure 18. 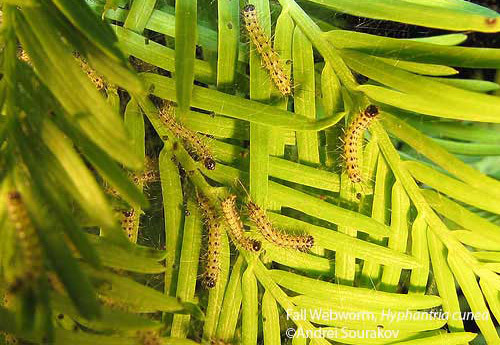 Close-up of fifth instar larvae of the fall webworm, Hyphantria cunea (Drury). Photograph taken in Gainesville, Florida. Photograph by Andrei Sourakov, Florida Museum of Natural History, University of Florida. Figure 19. Fifth instar larvae of the fall webworm, Hyphantria cunea (Drury). Photograph taken in Gainesville, Florida. Photograph by Andrei Sourakov, Florida Museum of Natural History, University of Florida. Figure 20. Freshly molted fifth instar larvae of the fall webworm, Hyphantria cunea (Drury). Photograph taken in Gainesville, Florida. Photograph by Andrei Sourakov, Florida Museum of Natural History, University of Florida. Figure 21. 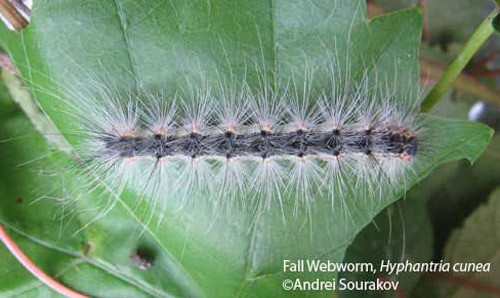 Dorsal view of a fifth instar larva of the fall webworm, Hyphantria cunea (Drury). Photograph taken in Gainesville, Florida. Photograph by Andrei Sourakov, Florida Museum of Natural History, University of Florida. Figure 22. Lateral view of a fifth instar larva of the fall webworm, Hyphantria cunea (Drury). Photograph by Lyle J. Buss, University of Florida. Pupae: Full-grown larvae leave the web to pupate in leaf litter or bark crevices. Fall webworms overwinter in the pupal stage. Pupation occurs in thin cocoons. The pupae are brown. Figure 23. Fifth instar larva of the fall webworm, Hyphantria cunea (Drury), inside a cocoon. Photograph taken in Gainesville, Florida. Photograph by Andrei Sourakov, Florida Museum of Natural History, University of Florida. Figure 24. Cocoon of the fall webworm, Hyphantria cunea (Drury). Photograph taken in Gainesville, Florida. Photograph by Andrei Sourakov, Florida Museum of Natural History, University of Florida. Figure 25. Pupae of the fall webworm, Hyphantria cunea (Drury), removed from a cocoon. Photograph taken in Gainesville, Florida. Photograph by Andrei Sourakov, Florida Museum of Natural History, University of Florida. 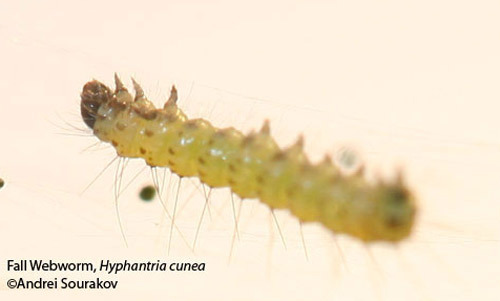 Part of Hyphanea cunea's success as a species can be attributed to the fact that its larvae are consummate generalists, capable of developing on a wide range of host plants. Preferred host plants include hickory, pecan, walnut, elm, alder, willow, mulberry, oak, sweetgum, and poplar. Caprifoliaceae: Lonicera spp., Sambucus canadensis, Symphoricarpos albus, Virburnum spp. Ericaceae: Oxydendrum arboretum, Rhododendron spp. Geraniaceae: Pelargonium spp., Geranium spp. Magno1iaceae: Liriodendron tulipifera, Magnolia spp. Oleaceae: Chionanthus virginicus; Fraxinus spp. - F. americana, F. excelsior; Jasminum spp., Ligustrum vulgare, Syringa spp. Pinaceae: Larix deciduas, Pinus spp. Rosaceae: Amelanchier canadensis; Crataegus spp. ; Cydonia oblonga; Malus spp. - M. angustifolia, M. coronaria, M. diversifolia, M. pumila; Prunus spp. - P. americana, P. avium, P. cerasus, P.domestica, P. ilicifolia, P. persica, P. serotina, P. communis; Pyrus communis; Rosa spp. ; Rubus spp. - R. allegheniensis, R. idaeus var. strigosus; Spiraea spp. Sa1icaceae: Populus spp. - P. alba, P. balsamifera, P. deltoides, P. fremonti, P. nigra var. Italica, P. tremuloides; Salix spp. 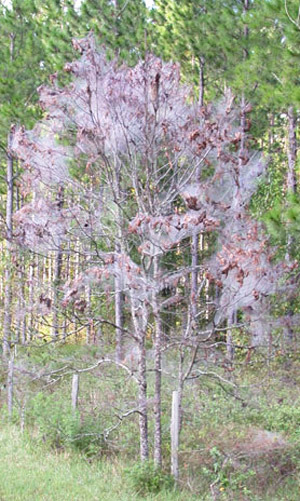 In the wild, within its native range, fall webworm does not usually damage the trees, since the defoliation occurs just before leaf drop. However, Hyphanea cunea is known to cause damage to ornamental trees, and is also known as a pest of sericulture because of its preference for mulberry leaves (Franz 1961, Yang & Zhang 2007). Figure 26. Damage to persimmon tree caused by larval feeding of the fall webworm, Hyphantria cunea (Drury). Photograph by Lyle J. Buss, University of Florida. Figure 27. 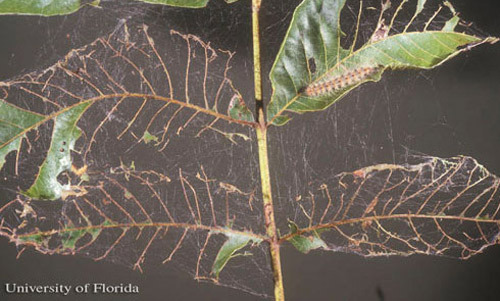 Leaf damage caused by larval feeding of the fall webworm, Hyphantria cunea (Drury). Photograph by James Castner, University of Florida. 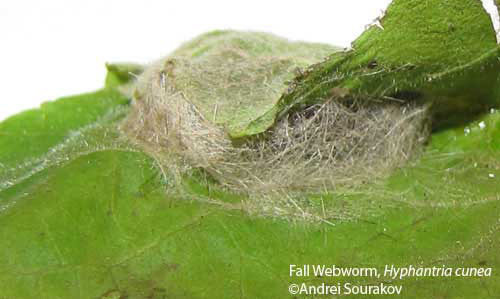 A fall webworm tent normally encloses the foliage at the end of a branch. 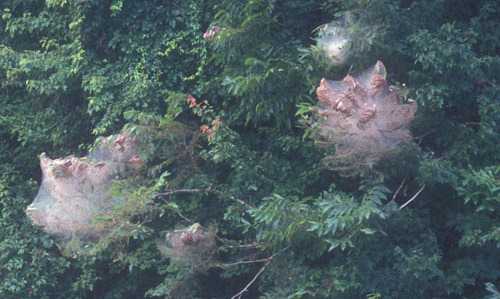 The caterpillars can build large silk tents that sometimes spread over several branches. At maturity, the larvae may reach one inch in length. Throughout their development, the caterpillars are able to make distinct jerking movements in unison if the nest is disturbed. Figure 28. Silken tent created by larvae of the fall webworm, Hyphantria cunea (Drury). Photograph by Lyle J. Buss, University of Florida. Figure 29. 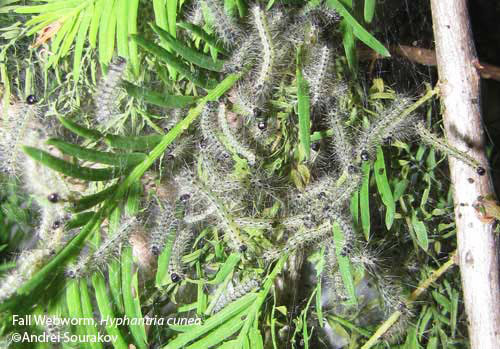 Numerous tents created by larvae from separate egg clusters of the fall webworm, Hyphantria cunea (Drury). Photograph by James Castner, University of Florida. 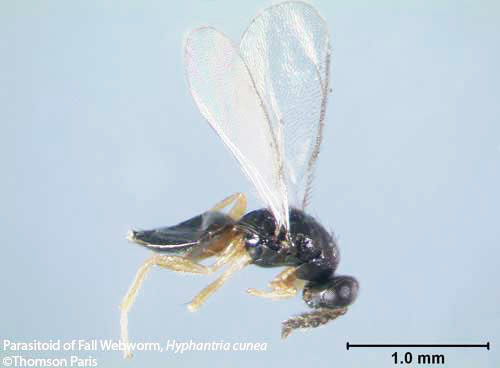 Tachinidae: Exorista japonica Townsend, Lespesia frenchii (Williston), Mericia ampelus (Walker), Pales pavida Meigen, Zanillia libatrix Panz. Figure 30. 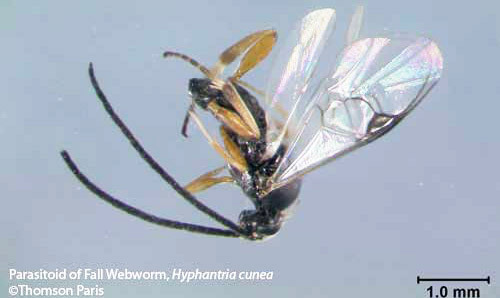 An adult parasitoid (unidentified species) of the fall webworm, Hyphantria cunea (Drury). Photograph by Thomson Paris, University of Florida. Figure 31. 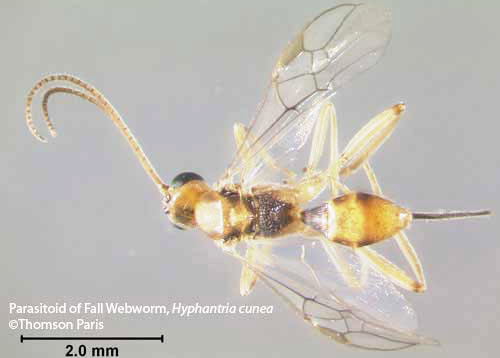 An adult parasitoid (unidentified species) of the fall webworm, Hyphantria cunea (Drury). Photograph by Thomson Paris, University of Florida. Figure 32. An adult parasitoid (unidentified species) of the fall webworm, Hyphantria cunea (Drury). Photograph by Thomson Paris, University of Florida. Franz JM. 1961. Biological control of pest insects in Europe. Annual Review of Entomology 6: 183-200. Heppner JB. 2007. The Lepidoptera of Florida: Introduction and catalog, Part 1. Florida Department of Agriculture and Consumer Services, Division of Plant Industry. 670 pp. Ito Y, Shibazaki A, Iwahashi O. 1969. Biology of Hyphantria cunea Drury (Lepidoptera:Arctiidae) in Japan. IX. Population Dynamics. Researches on Population Ecology (Kyoto) XI: 211-228. Morris RF. 1963. Synonymy and color variation in the fall webworm, Hyphantria cunea Drury (Lepidoptera: Arctiidae). Canadian Entomologist 95: 1217-23. (MPG) Moth Photographers Group. (2010). 930319 – 8140 – Hyphantria cunea – (Drury, 1773). North American Moth Photographers Group. http://mothphotographersgroup.msstate.edu/species.php?hodges=8140 (13 December 2010). Takeda M. 2005. Differentiation in life cycle of sympatric populations of two forms of Hyphantria moth in central Missouri. Journal of Entomological Science 8: 211-218. Wagner DL. 2005. Caterpillars of Eastern North America. Princeton University Press. Princeton, 512 pp. Yang ZQ, Zhang YA. 2007. 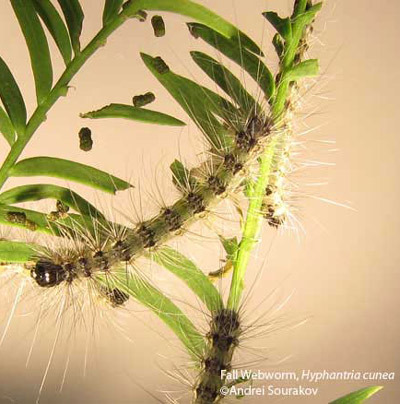 Researches on techniques for biocontrol of the fall webworm, Hyphantria cunea, a severe invasive insect pest to China. Chinese Bulletin of Entomology 44: 465-471. Publication Date: December 2010. Latest revision: April 2011. Reviewed: April 2014.